This page includes The WFSC Announcements columns from the 2002 issues of Across the Fence Post. Although a few weeks late, all clubs should have their 2002 dues notices by January 1. Notices were sent to either your club's treasurer, WFSC representative, or a contact associated with the WFSC Executive Board. The deadline for 2002 dues is March 1. Are you enjoying the franking on your ATFP mailings? If so, thank Bert Hart, a retired U.S. Postal Service employee and member of the Badger Stamp Club (Madison). Upon retirement, Bert became a part-time dealer of U.S. stamps and is helping Chuck Shoemaker, our ATFP distributor. Chuck and Bert meet at the Madison Post Office and apply all those wonderful se-tenant issues that are hard to find in used condition. Bert acquires much of his discount postage through eBay and can be contacted at berthart@merr. com. Our thanks, too, to Chuck for doing a fantastic job with all the duties and responsibilities involved with the newsletter distribution. Dates for WISCOPEX '03, which will be sponsored by the Outagamie Philatelic Society, are April 26-27. The show will be held at the new Fox Valley Lutheran High School in Appleton, WI. The WFSC will produce a first-day cover for the Wisconsin Greetings stamp, to be issued on April 4. Covers will include the USPS capital cities common first-day cancel. Jay Bigalke designed the WFSC's multicolored cachet. To order by mail, send $3 each to: MaryAnn Bowman, P.O. Box 1451, Waukesha, WI 53187. Make checks payable to the WFSC and include a SASE. WFSC President A1 Marcus has appointed Dwane Kaplenk to serve as the WFSC newsletter-advertising manager. Dwane is a member of several WFSC clubs. He is a former WFSC Southwest Region VP and proprietor of Rock Aires Collectables, located in Rockford, IL. Dwane can be contacted at: P.O. Box 2301, Rockford, IL 61131 - phone 815-398-0813, rockaires@xta.com. The WFSC greatly appreciates your cash donations submitted with 2002 dues! UW-Madison student Jay Bigalke has been appointed to serve as the sole member of the Wisconsin Stamp Suggestion Committee. Committee responsibilities are to prepare letters of opinion to the U.S. Postal Service, research potential Wisconsin-related stamp subjects, and submit correspondence to various officials (including the Citizens' Stamp Advisory Committee) to promote Wisconsin-related USPS issues. Jay's interest in cachet making for USPS new issues coincides rather nicely with the committee's objectives, and particularly since he signs all his creations "FPMG" - Future Post Master General. Direct your new issue concerns to Jay at: POB 260063, Madison, WI 53726 - phone 608-264-2486, jabigalke@students.wisc.edu. 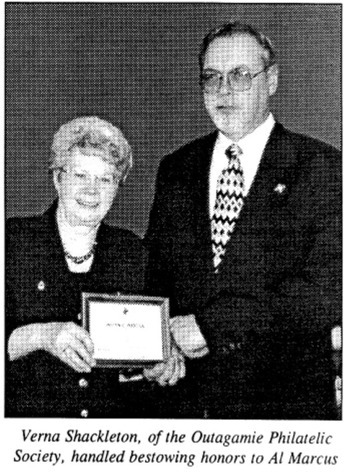 • Art Arntsen of the Badger Stamp Club for auditing the WFSC's 2001 financial records. Ken Grant, of Baraboo, WI, will succeed Karen Weigt as ATFP editor. Karen will continue to produce ATFP through the December 2002 issue, with Ken stepping in as of the January 2003 edition. Transition details will be worked out this summer with pertinent changeover information to be published this fall. Our many thanks go to Ken for volunteering to serve in this vital position! 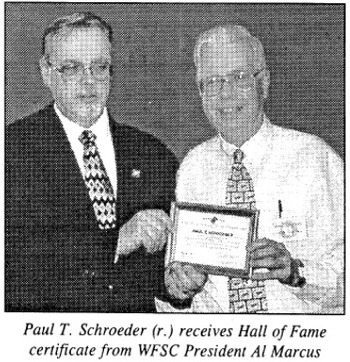 On March 9, delegates at the 2002 Annual Business Meeting voted to induct Paul T. Schroeder and A1 Marcus into the Wisconsin Philatelic Hall of Fame. Paul's nomination came from the Oshkosh Philatelic Society. He is the WFSC's immediate past-president; he also served for three years as the WFSC's East Central Region VP. On the national level, Paul is past-president and treasurer of the Post Mark Collectors Club. He has written an abundance of articles that have been published in a variety of philatelic publications. The list is extensive with all of Paul's other memberships and volunteer services on behalf of philately. A1 was totally surprised when he was asked to leave the meeting room while delegates voted on his nomination initiated by the Outagamie Philatelic Society. His other local club memberships include the Oshkosh and Green Bay philatelic societies. A1 was the WFSC's VP from 1995-2001; he is currently serving as president. If you want your show/bourse to appear on the listing covering events through the summer of 2003, send details by no later than August 15, 2002, to: Karen Weigt, 4184 Rose Ct., Middleton, WI 53562-4339, phone 608-836-1509, or e-mail karenweigt@cs.com. The meeting will be held at TRIPEX Stamp Fair in West Allis. Anyone who is interested is invited to attend and is extended the right of discussion. Contact WFSC Secretary Karen Weigt if you'd like to be included on the mailing list for meeting details. ATFP goes bimonthly for the summer with a May-June and a July-August issue. Monthly issues resume in September. To become an ATFP page sponsor send $25 per issue to: Karen Weigt, Editor, ATFP, 4184 Rose Ct., Middleton, WI 53562. The annual flier will be updated and sent with the September ATFP. If you want your show/bourse to appear on the listing covering events through the summer of 2003, send details by no later than August 15, 2002, to: Karen Weigt, 4184 Rose Ct., Middleton, WI 53562-4339, phone 608-836-1509, or e-mail karenweigt@cs.com. • name • street address • phone number • e-mail address. The WFSC very much appreciates your participation in the ATFP page-sponsorship program. To become an ATFP page sponsor, send S25 per issue to: Karen Weigt, Editor, ATFP, 4184 Rose Ct., Middleton, WI 53562. An updated 2002 WFSC member club mailing list is available for direct-mail club show/event publicity purposes. Request a copy from: WFSC Central office and Secretary, Karen Weigt (address shown above and on p. 2). Note: the list is for WFSC member club use only. The WFSC has produced a first-day cover for the Edna Ferber stamp issued at Appleton, WI, on July 29. The bicolored cachet, designed by Jay Bigalke, highlights one of Ferber's well-known works. To order by mail, send $3 each to: V1aryAnn Bowman, P.O. Box 1451, Waukesha, WI 53187. Make checks payable to the WFSC and include a SASE. The WFSC is most grateful for your participation in the ATFP page-sponsorship program All WFSC clubs and individuals who are members in good standing of a WFSC club are welcome to become an ATFP page sponsor. To do so, send $25 per issue to: Karen Weigt, Editor, ATFP, 4184 Rose Ct., Middleton, WI 53562. To participate, send your covers and a 55C SASE to: WFSC, P.O. Box 1451, Waukesha, WI 53187. Nominations are being accepted for the 2003 Wisconsin Philatelic Hall of Fame. The deadline is December 31, 2002. See story on p. 4 for details of the nominating procedure. The meeting will be held in Iola, WI. Anyone who is interested is invited to attend and is extended the right of discussion. Contact WFSC Secretary Karen Weigt if you'd like to be included on the mailing list for meeting details. The WFSC is most grateful for your participation in the ATFP page-sponsorship program. All WFSC clubs and individuals who are members in good standing of a WFSC club are welcome to become an ATFP page sponsor. To do so, send $25 per issue to: Karen Weigt, Editor, ATFP, 4184 Rose Ct., Middleton, WI 53562. The exchange offer will expire October 31, with returns being made by mid-November. See the September 2002 issue of ATFP for details of exchange rules. Nominations for the 2003 Wisconsin Philatelic Hall of Fame must be submitted by December 31, 2002. For details of qualifications and nominating procedures, see the September 2002 issue of ATFP (story on p. 4) or request information from Karen Weigt, Secy., WFSC, 4184 Rose Ct., Middleton, WI 53562. To order your set of 2002 pages, send $4 to: Greg Schmidt, 1978 Fox Burrow Ct., Neenah, WI 54956. Make checks payable to WFSC. The WFSC has produced a first-day cover for the 37-cents Wisconsin Greetings stamp issued on October 25 in New York City. The 37-cents FDC includes the New York FDOI cancel. 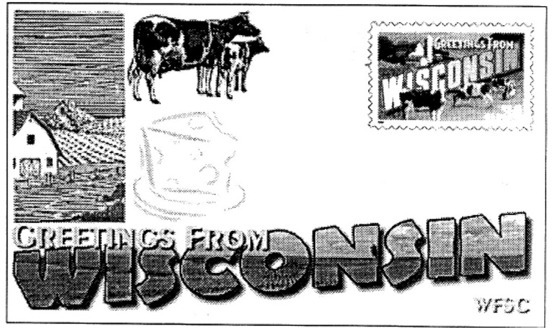 On April 4, 2002, the 34-cents Wisconsin Greetings counterpart was issued nation wide. At that time, the WFSC offered an FDC with a Madison, WI, FDOI cancel. The multicolored cachets for the 34 and 37-cents FDCs are identical. Send mail orders for the 37-cents FDC to: Karen Weigt, 4184 Rose Ct., Middleton, WI 53562. Send mail orders for the 34-cents FDC to: Deanna Juhnke, 3701 Jordan Ln., Stevens Point, WI 54481. Include a No. 10 SASE and payment of $3 each. Make checks payable to the WFSC. The WFSC very much appreciates your generous donation in support of ATFP. Thank you for your additional donation to ATFP in memory of Bill Otto.